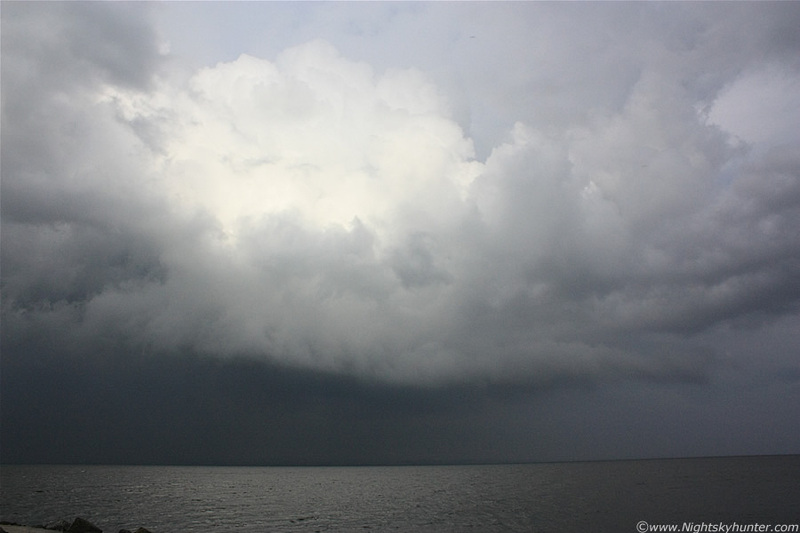 This is the first time since I purchased my Canon 450D that I had to use ISO800 for a day time storm shot, that shows just how dark the sky was at low level, the last time I seen a storm that dark was in 2009 when a large thunderstorm boomed away over the Lough during the Spring, that was in the Ballyronan area, this was a little further S at the mid point of the W shore of the Lough. 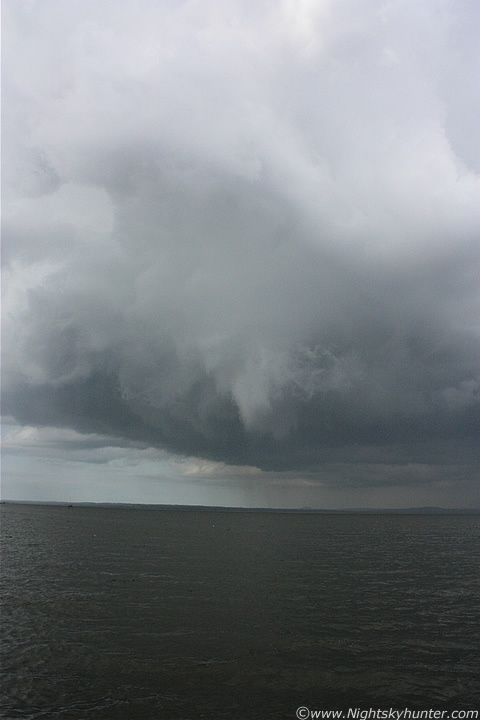 There's something very special about Lough Neagh because that body of water seems to invigorate convective cells in a major way, this place has a history of strong storms, waterspouts, funnel clouds, and onshore damaging tornadoes, this is why I have made the Lough Neagh basin one of my prime chasing grounds for vortex events. The breeze/wind over this large body of water can greatly aid in local convergence with an abundance of moisture to fuel any cells. ISO800 in conjunction with the other settings I dialed in did a great job of exposing the storm very accurately, even the white balance is close to reality so I was quite happy with the way these turned out despite the slight noise visible on the images. Another wide angle vertical shot of this monster looking E at where the inflow/outflow regions overlap, this was truly a beefy storm indeed. 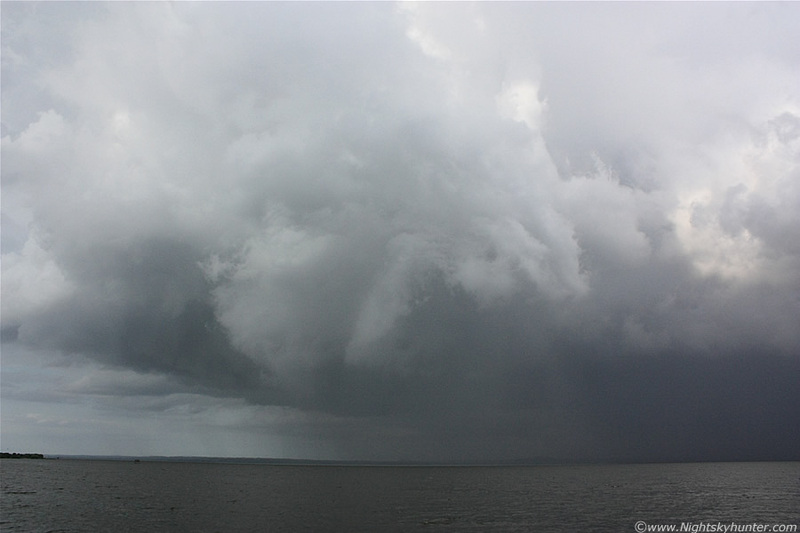 We suspected at the time that there must have been people along the E shore of the Lough who were watching this storm, especially from Antrim/Toome direction who would have been facing roughly S and seen it head-on. This was when the storm was at it's very best and when Conor and I were jumping for joy, this was without doubt the best storm structure we had seen all year, and certainly the best I have seen since June 2009 from the same area. The rotation here was absolutely spectacular, just imagine this entire thing spinning anti-clockwise like a spaceship with the most intense spin concentrated on that main lowering under the primary updraught tower. 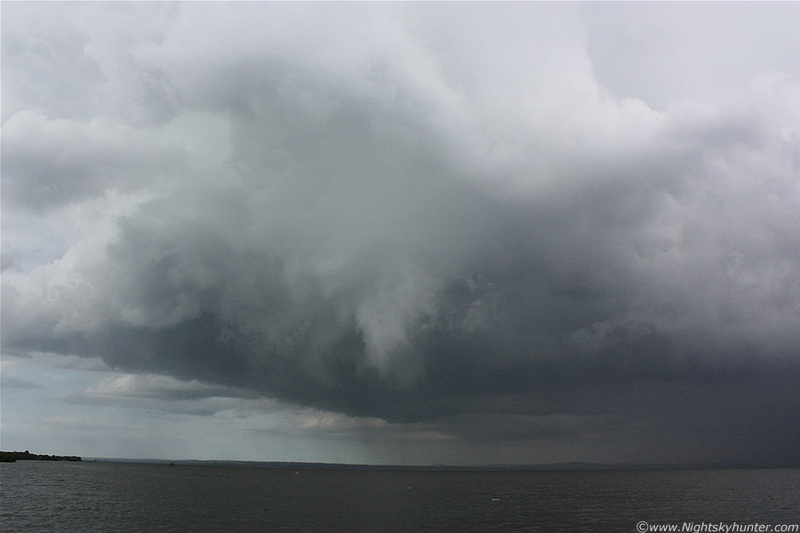 On the video you can appreciate the size of this structure much better, look carefully at 1 min 44 sec's onwards and you can see a stubby white-coloured funnel cloud/tuba with it's tip pointing down at an angle towards the Lough and directly at us, it soon vanished, then more spin-ups dropped. Even on this still image you can see a narrow tube getting wrapped around the main lowering in a horizontal direction. This was awesome! This vertical capture shows the structure very well, note the pronounced collar (bright white) near the top of the frame, that's a solid striation band/ring around the main tower, and directly above the lowering, you don't get cloud structure like that unless you have a serious rotating updraught. Now here's the cool part, imagine you are looking at the view now, standing on the Lough shore, then you tilt your head 90 degrees back so you can see directly overhead, that's where the top of that rotating updraught tower was!. Sat24 images showed that this top was enormous, and clearly the tallest cell in all of UK/Ireland at that time of the evening. Classic bell-shaped updraught base bulging on either side. The motion under this was breathtaking with many areas of cloud swirling around, spinning, and lifting upwards with vertical motion all at the same time complimenting the entire spinning structure. This motion was so stunning that we honestly believed a large waterspout was going to drop down in front of us at any moment!. Rotating cell, multitude of spinning features at centre and wrap around striation band/ring at top. We felt so incredibly fortunate to have found this location because it provided us with a perfect close range view on the W-SW side of the rotating updraught, had we been to the SE or E, all we would have seen was a dark mess of cloud and rain, SAT images showed a great deal of mid level cloud after 18.30 on the S and E side so anyone watching from that side would have been unlikely to have seen the structure or rotation. This was text book positioning, it couldn't have been more perfect. This was a beast!. The precip line on the far side was actually rotating around with the base from R to L. The entire motion of the cell was strange because when we first saw the cell the udraught region was above the car park, then the cell slowly drifted E over the Lough, then it began moving back W again towards us while rotating the entire time, it was fairly close to us at this stage, so close that the wide angle 18mm lens only shows a portion of the storm. 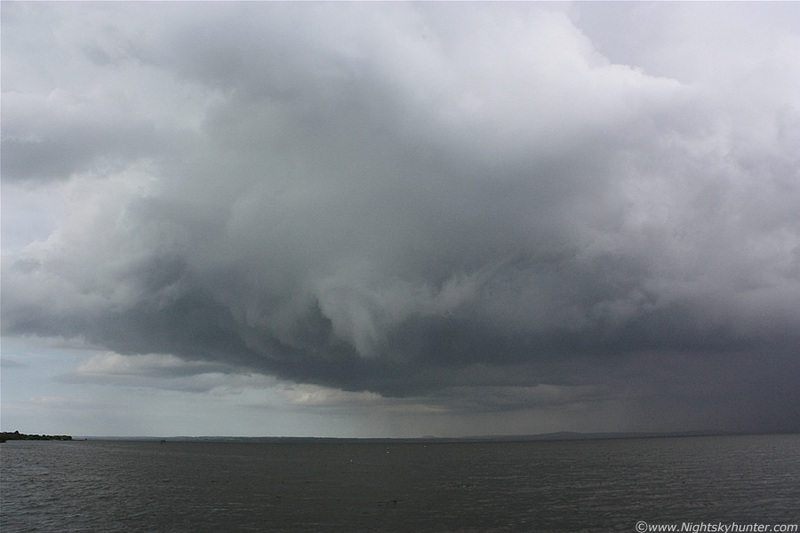 The motion of those grey lowerings were fantastic, at one stage we saw four vertical fingers' of cloud rotating at the same time, then two very fine rope-like lowerings spun out to the SW from the nearest one in a horizontal direction. Look at that region wrapping up like a huge Slug curling around the underside of the base. That precip line was getting closer and the wind was picking up, on occasion rain drops hit the camera lens and the glass on the video camera so I had stop shooting and absorb the drops with kitchen roll which I always have with me in the camera bag for times like this. 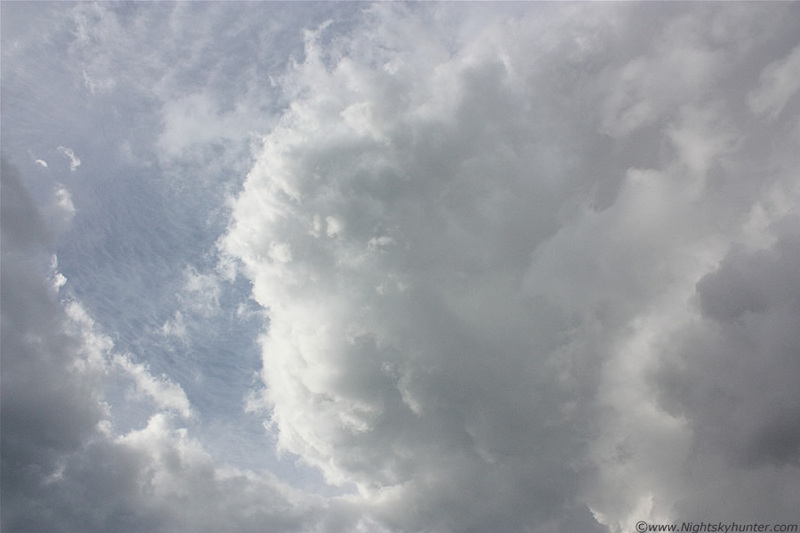 I was delighted that I had brought my video camera with me this time, I promised myself that I would never leave it at home again on a convective day. I really need to get myself a high quality video cam though, something with better MP and larger frame size and speed, it would have been great to have it mounted on a tripod and record the storm the entire time we were there, then it could be turned into a time lapse video later which would have shown the rotating motion of the storm in spectacular fashion. For this I was just using the video mode on my old Fujifilm S5600 5.1MP bridge camera with 3 frames/sec rate with poor performance in low light conditions. Having said that I was grateful to have had it because there are times when still images just don't do justice to a scene without the live panning capabilities with a digi cam. This scene completely blew us away, this is looking directly at the zenith at the top of the rotating updraught tower where it ended in a huge solid plume high in the sky complete with knuckles, this updraught was also well tilted forward. On the video I do a pan from the rotating base to this plume which really does the storm justice. This is only 2 min's after the previous base shot (two up) and look at the difference!. The cell is still rotating but it had brought with it a dense rotating rain and hail curtain now very close to us, it was extremely dark in there, remember this is ISO800. A faint section of a rainbow is visible among the hail to the far R, you will need to look closely to see it. Nasty!, that bow is still visible in the darkness to the ROC. It was getting cold and breezy as the wind gusts strengthened then a loud rumble of thunder roared across the Lough from the LHS, we didn't see the lightning as it must have been on the other side of the precip however the thunder was loud enough to hear very distinctly over the gusting wind and water crashing against the shore. Later we found out that ATD sferics had recorded a nice little bunch of c-g lightning from this storm, this was the last rumble which we heard, the other strikes must have happened when the storm was further SW when we had spotted it earlier from a distance on the road. This was now the flanking region where new towers shot skywards at a rapid pace, there looked quite huge and solid as they stole our attention as the late evening Sun broke through to light them up so we stood there admiring their majestic beauty in the hope of seeing more lightning or perhaps even a small funnel or waterspout from the back of the line where these things are most likely to appear. The outflow wind from this storm was really impressive with strong bitter cold wind gusts which raced across the Lough to slam us with big drops of precip mixed in. The temp in the wind chill turned so cold that my hands were shaking, I was only wearing a light shirt with no sleeves and I was really feeling it. You can sense the power of the outflow at the end of the video clip. 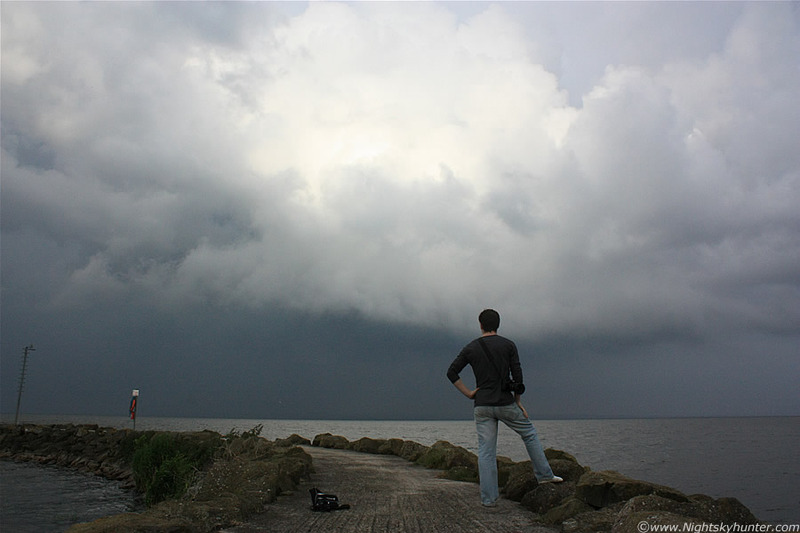 Here's Conor standing on the pier in a world of his own as he studied the storm while the wind lashed the shore. That metal pole at the end of the pier was where we were standing for all of the previous images. The cell looked outflow dominant now and it looked like the show was over, but what a show it was, we had been watching from 18.00 until well after 19.00 BST, so it was rotating for at least one hour, and considering that it was active for a while before we arrived at the scene this period of rotation must have been much longer indeed. Based on this vivid rotation and the visual storm structure I'm certain, with a high degree of confidence, that this was a Mesocyclone for a part of it's life, and hence had Supercell characteristics!. Here's a fun video clip, the quality is not great and I tend to shake the camera around a bit due to the excitement, not to mention the wind blowing near the end. You can appreciate the length, height, and structure of the cell in this including the primary updraught plume, sorry for any brief vernacular or excited chat you may hear on it. We got back in the car and left the storm as new convection was visible to our W and SW which was rather surprising since it was late evening and the CAPE was supposed to have died away, however the sky was still talking so we went on our second chase of the day. Just to the W of the Lough, between Moneymore and Cookstown, was the best display of Whale's Mouth I had seen in a long time, the entire sky was covered with crazy structure with very complex 3-d like patterns, it filled the windscreen as we stared up at it in amazement but we didn't take any shots as we wanted to see what was behind it. We passed below the shelf and emerged at the rear of the cell, that was another stunner!, we quickly pulled into a narrow lane in the country which probably led to someone's house and got out for a look. The back of the cell had a tremendous dark updraught tower erupting up at incredible height, almost as large as the Lough cell, the towers where leaning over towards the E and had 4 or 5 huge bulges along it's height indicating more rotation, this was another rotating updraught!. It looked quite a sight with black towers overhead and that Whale's Mouth in the distance ahead of it. Then another cell came into view further SW in the direction of Cookstown, this one was huge with the best rain free base (RFB) we had seen of very large size and striation lines along it, this was well separated from the precip region, the cell covered a good portion of the skyline with several moderate cores. So we stood there between the two cells trying to decide what to do so we opted for the Cookstown cell since it looked like it was going to drop something at any moment. We took short cuts through the twisting country roads, these were mental at times and very dangerous with just enough room for one car, we even encountered two hair pin 90 degree turns in succession with a stone bride and river crossing at the same time, it was fun trying to stay on the road while chasing, there were warning signs on the roads indicating that the roads were prone to flooding. 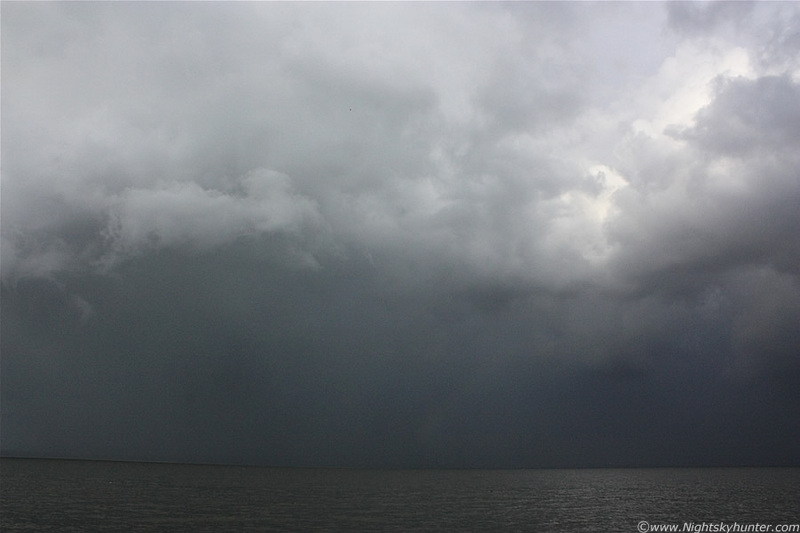 Once we got close to the cell the RFB had turned very mushy and it was clear that the cell was outflow dominant so we headed back home through persistent rain and decided to call it a day just before sunset. 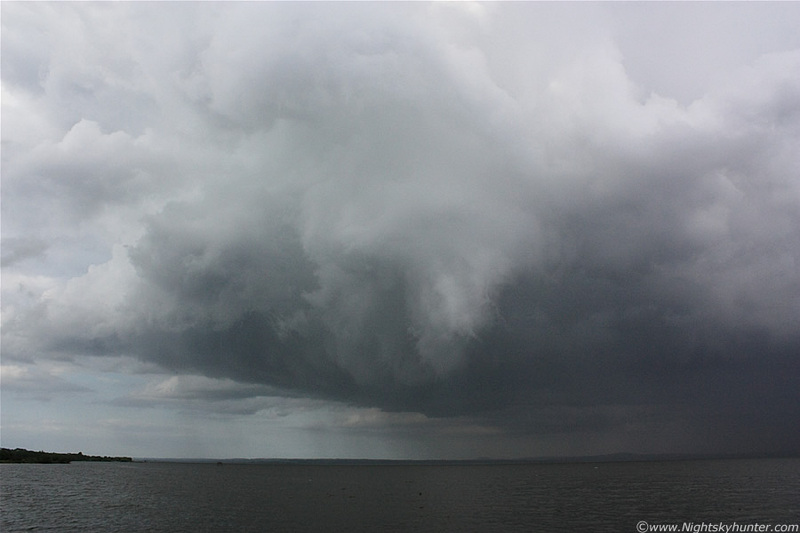 We were buzzing all the way home, our chat was dominated by that meso over the Lough, we couldn't wait to get home and check out the SAT images and the chat on the web as we were certain other chasers must have seen it, however that was not the case as far as we know to date. 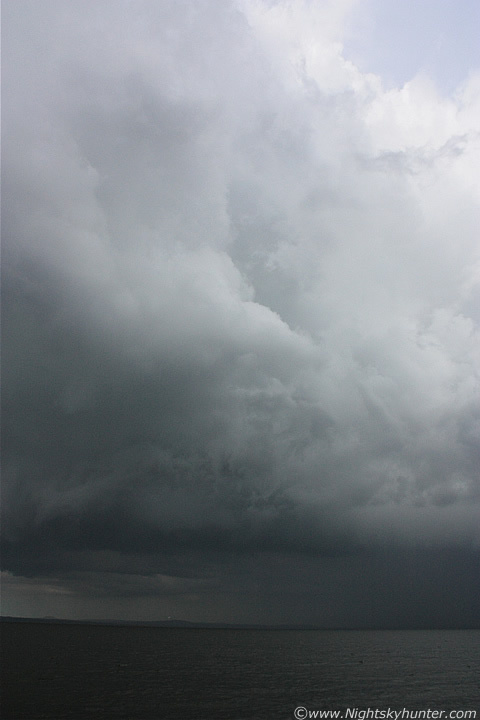 What was astonishing was the fact that this was the only thunderstorm to form over Ireland/N. Ireland that day and we had intercepted it at the correct time, location, at the perfect viewing angle so everything came together to make it our most successful chase of the year. The interesting thing was that our success was governed completely by visual observation, experience, and instincts as we had no mobile net coverage in the car so this made the chase all the more special. 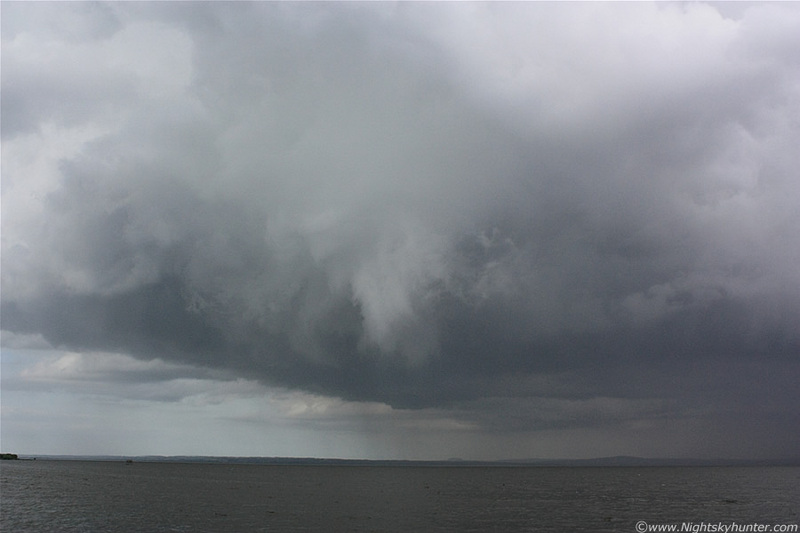 We did alot of miles around those roads I can tell you, however the reward was high - a thunderstorm with Mesocyclone over Lough Neagh on a marginal CAPE set-up - what a result!. The conditions must have been perfect for meso formation with moisture, enough instability, convergence, and wind shear. We suspect that had this been a day of 1000 CAPE we would probably have an image of a perfect waterspout over the Lough by now. 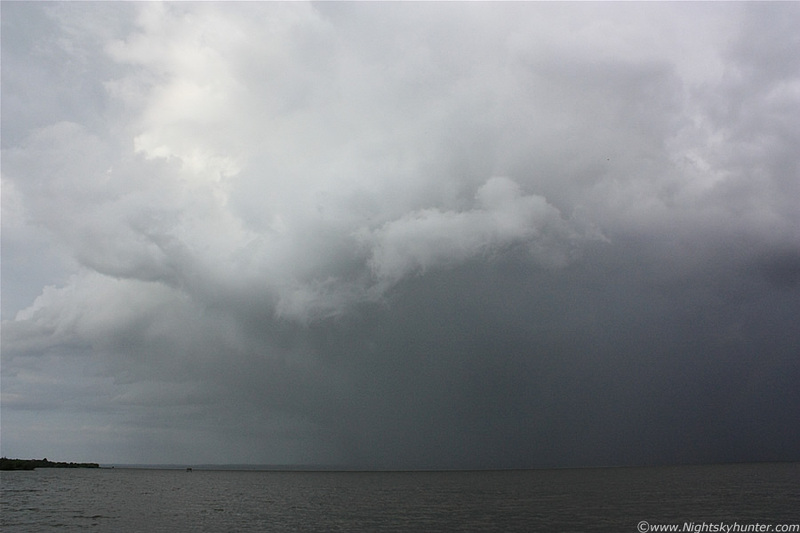 We will be back in the Lough Neagh area again when the next storms fire over that area - I've a feeling something major is going to happen there in the future and we intend to be there. Thanks for reading this, I'm still buzzing as I write.